A collection of articles of research presented in the 2016 and 2017 IMAA workshops will be published as a special issue for Environmental Archaeology. All articles are currently in press and available online. Thank you to everyone who took part in and helped to organise the 2019 IMAA workshop. The blog has now been updated with some photos from the weekend and with the abstracts of the excellent oral and poster presentations. The digital model of the recreation of Glastonbury Lake Village by South West Heritage Trust. Details of the 3D Pollen Project led by UoR PhD researcher, Oliver Wilson. The meal on Saturday evening will take place at the Sizzling Spice (Bangladeshi and Indian Cuisine), which is next to campus. Those participants who expressed an interest in coming to the meal will be emailed separately about these arrangements. Please let us know if you are no longer able to come to the meal. All spaces have now been filled for the 2019 IMAA workshop. Please email imaaworkshop@gmail.com if you would like to be put on the waiting list. Equally, if you are unable to attend the workshop, please let us know so that we can give the space to someone on the waiting list. Many thanks! We’re looking forward to meeting all the participants in Reading. IMAA 2019: Save the date! 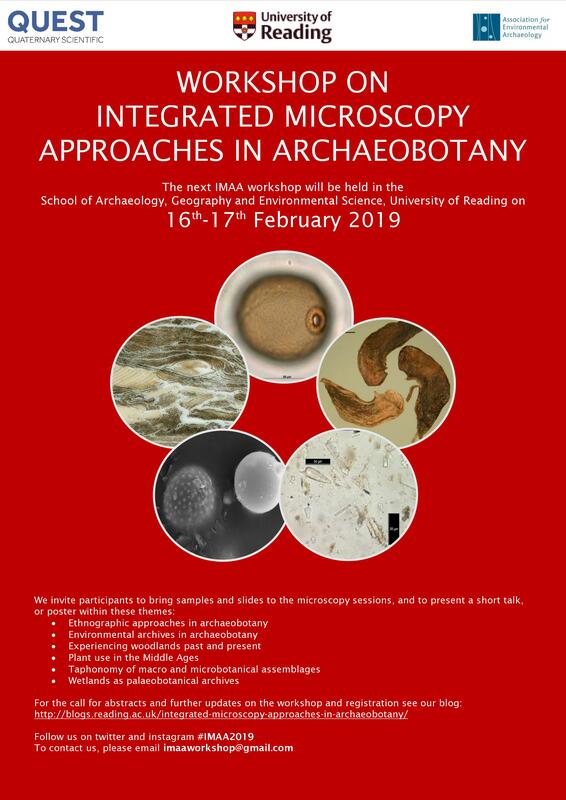 The next Integrated Microscopy Approaches in Archaeobotany workshop will take place on February 16th – 17th 2019 in the School of Archaeology, Geography and Environmental Sciences, University of Reading, UK. More details including the themes and call for abstracts will follow soon!